Raku ware (楽焼 raku-yaki) was a type of Japanese pottery used in Japanese tea ceremonies, commonly chawan tea bowls. ... In the traditional Japanese process, the fired raku piece is removed from the hot kiln and is allowed to cool in the open air. Kilns and firing · you can easily build a kiln or buy one that goes up and down! ‎Raku reduction firing and post reduction is what changes the copper carbonate and iron oxide to lustrous metallic shine. Raku Kilns "they go up and down"
Raku firing is different because you fire the object in a gas kiln and watch the glaze melt, when the glaze looks right (shiny) you open up the kiln and grab your pot with raku tongs, then into a metal container of combustible materials. This, secondary reduction colors the exposed clay body black. And reduces the copper to a metallic lustre. 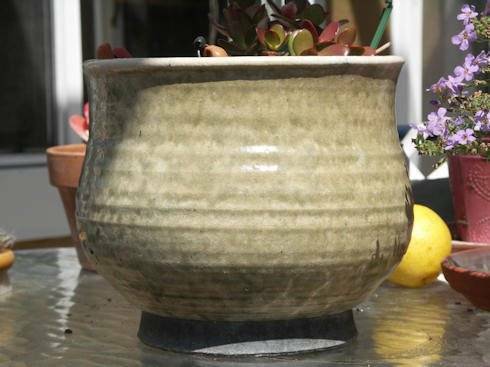 These glazes only look as shown when fired in the raku tradition. Apply glaze to cone 08 bisque, when dry preheat the pots near the kiln. Fire to around 1800 F, when the glaze smooths out and no bubbles are present open the kiln, take out the pot (using gloves and tongs). Quickly move the red hot pot to a metal trashcan full of leaves, shredded paper or ?? ?, place it in the ashcan and cover. When the smoke clears you can see your results.